The Body Shop Vitamin E Body Butter | £13 // The Vitamin E Body Butter has one of the lighter formulas that The Body Shop have. It's one of the few that I would use all year round as it doesn't feel too heavy on the skin and sinks in a lot quicker than say the Coconut version. I tend to order all my TBS products online and for this one I wish I had smelt it first in store. I was pretty certain I'd used this before and liked the scent but when I got this in the post I was surprised I didn't like it that much. It hasn't stopped me from using it as it is quite a light scent but it would stop be from buying it again or anything else from the same range. That's just me though as I know a lot of people who love this scent. It is a shame though as this has one of my favourite formulas out of them all as it keeps my dry skin moisturised without feeling like I'm really wearing anything especially if I apply it before bed and after a bath. The Body Shop Raspberry Body Scrub | £12.50 // This raspberry body scrub is very much like the Blueberry version I blogged about here. 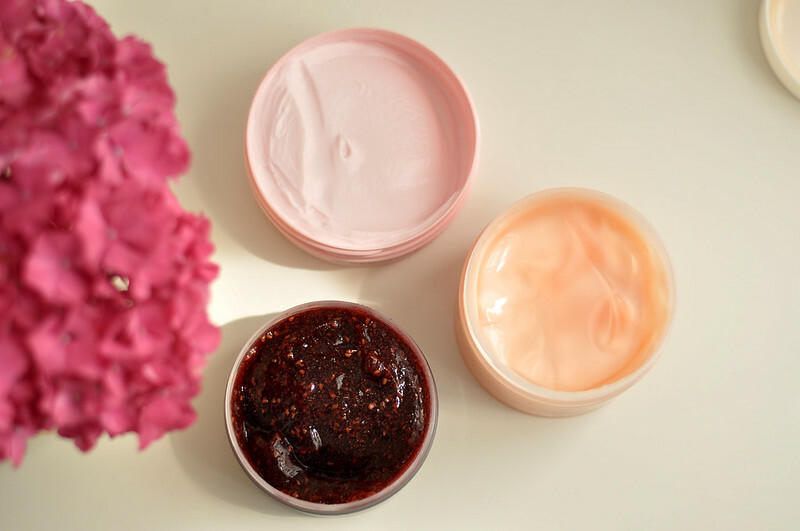 The only difference between the two is the scent obviously but also this raspberry scented scrub is still available to buy, at least for now. It has a pretty unique texture compared to other body scrubs I’ve tried. It’s a gel almost jelly like scrub that when you apply it looks and feels like you’re spreading jam all over yourself. On wet skin it isn’t very abrasive and I’ve found it works better on dry skin. I tend to apply it and then hop into the shower or bath and wash it away. It’s not the most ideal way of using it but I don’t want to waste a product so will always try and find the best way to use it. While I love the scent, there's better body scrubs out there so unless it's on offer, I'd say skip this and get one from Soap & Glory. 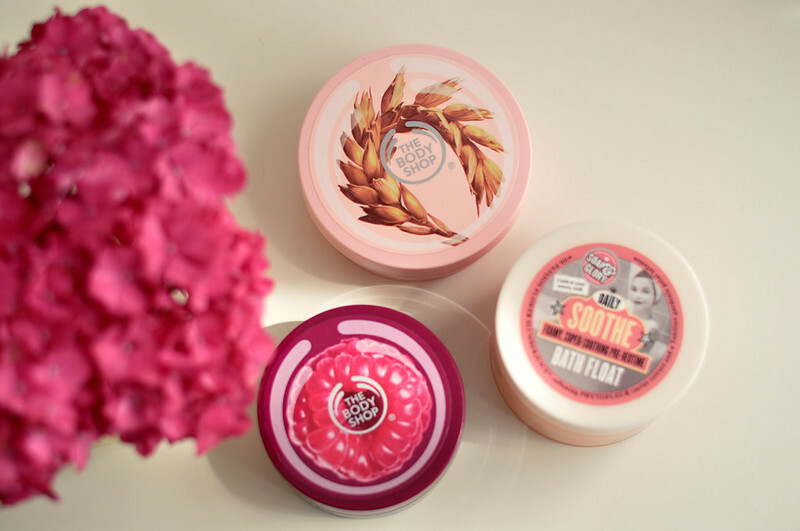 Soap And Glory Daily Soothe Bath Float | £8 // If you liked the idea of The Body Shop Honeymania Bath Soak but perhaps didn't like the floral scent but want the same sort of product, then this one from S&G is for you. S&G don't have many products for the bath, apart from another bubble bath, so I was keen to give this a try when I saw it in Boots. It has the Mist You Madly scent which I really love. It's a mix of bergamot, blackcurrant, magnolia, freesia, vanilla and musk. The only downside to this bubble bath is how you have to scoop it out with your hands and then swish up the water to distribute the product. I have a honey dipper from the Laura Mercier Honey Bath which does make it easier to use. You could simply order one off Ebay if you don't like to use your hands but it would be better in a bottle or tube. Once in the water it creates a lot of bubbles and the water is incredibly moisturising. I wouldn't pay the full price for it though as more often than not S&G is on 3 for 2.